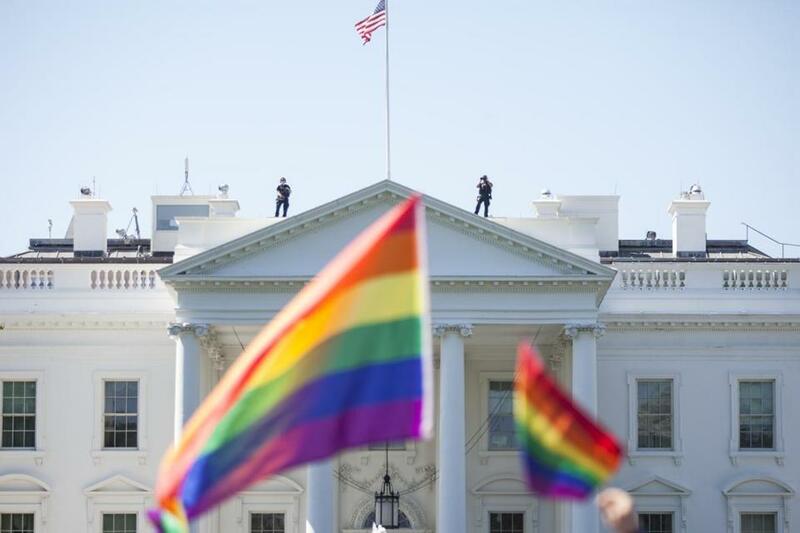 A rainbow flags past the White House during the Equality March for Unity and Peace in June. President Trump’s announcement Wednesday that transgender people will be barred from serving in the US military comes despite past suggestions of support for lesbian, gay, and transgender rights. In his speech accepting the Republican nomination at the convention in July 2016, he expressed support for those killed in a mass shooting at a gay nightclub in Orlando — though, in an interesting rhetorical twist, he appeared to blend that message with his familiar antiterror message. “Only weeks ago, in Orlando, Fla., 49 wonderful Americans were savagely murdered by an Islamic terrorist. This time, the terrorist targeted LGBTQ community,” he said. In a speech shortly after the attack, Trump also said, “Ask yourself, who is really the friend of women and the LGBT community: Donald Trump with his actions, or Hillary Clinton with her words? By the way, the LGBT community is just — what’s happened to them is just so sad, and to be thinking about where their policies are currently with this administration is a disgrace to that community, I will tell you that right now,” the Washington Post reported. Trump in April 2016 also appeared to oppose North Carolina’s law forcing transgender people to use the bathroom that matches their gender assigned at birth, saying the law should have been left the way it was. “There have been very few complaints the way it is. People go, they use the bathroom that they feel is appropriate; there has been so little trouble,” he said on the “Today” show. He also said that transgender celebrity Caitlyn Jenner could use whatever bathroom she chose at Trump Tower. The move to bar transgender people from the military isn’t the first disappointment for transgender rights activists regarding the Trump administration. In February, the administration announced it would revoke an Obama-era order allowing transgender students to use the school bathroom matching their gender identities. Jennifer Levi, director of the transgender rights project at GLBTQ Legal Advocates and Defenders in Boston, said Trump has been “inconsistent at best” in his statements about LGBTQ rights. “During the campaign, he made statements that sounded potentially more supportive. But the action of this administration has been hostile to the community,” she said.